March 21, 2016. 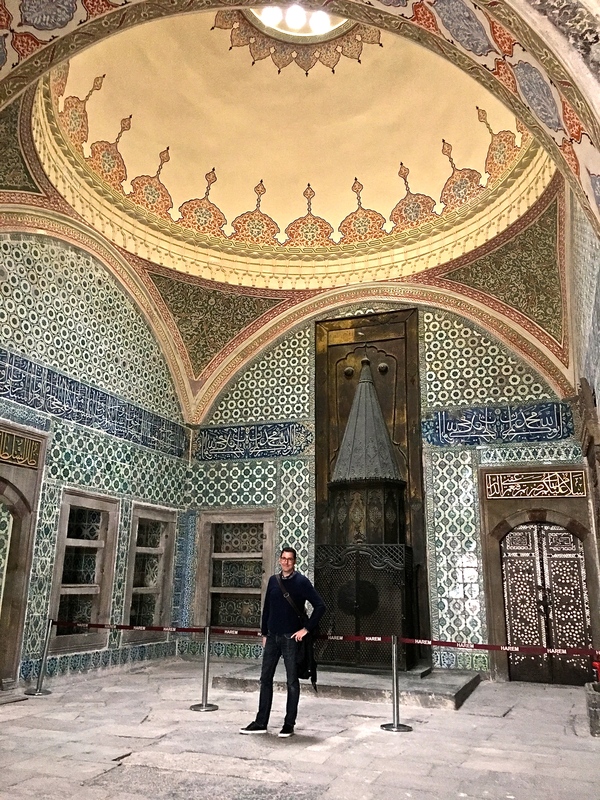 Turkey is simply chockablock with “bucket list” sites, especially for folks like Matthew and me, who’ve studied architecture and archaeology. 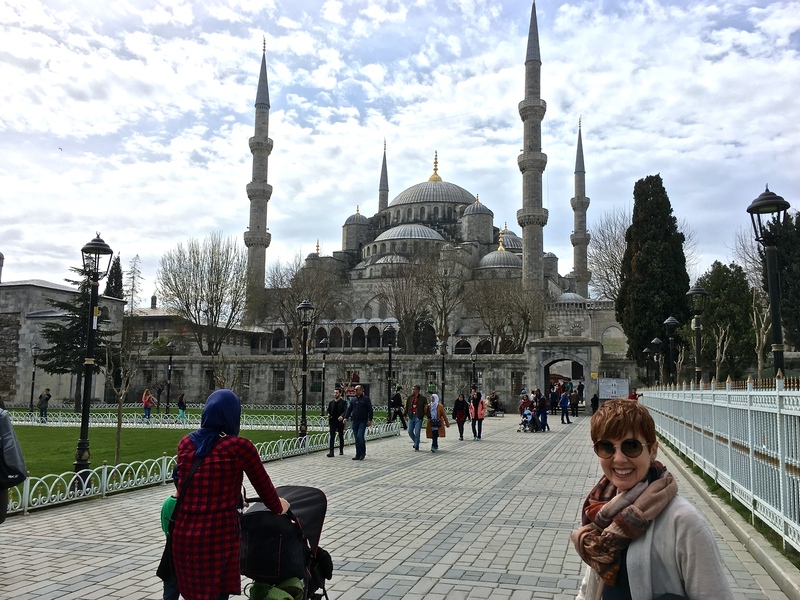 But rather than bombard you with basic guidebook information, I thought I’d share with you my favorite fun factoids and most memorable moments of Istanbul’s historical sites. I’ve covered a lot of territory below, so prepare yourself. Plus, I’ve created some gargantuan photo galleries that I hope will whet your appetite for a visit. (Click on the images for bigger views and captions.) Enjoy! 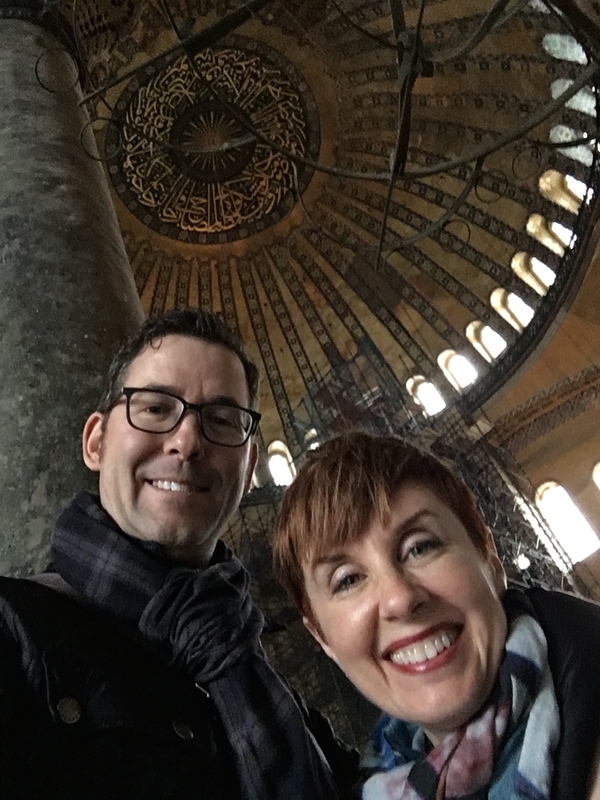 Check out Hagia Sophia’s dome above us. In 532 A.D., Byzantine Emperor Justinian hired two Greek geometricians to engineer a monumental edifice that would bring him glory. The church took five years to build and its dome stands 185 feet high and about 105 feet in diameter. Inside, Hagia Sophia still has the classic Christian basilica floor plan — a large central space flanked by narrow side aisles and rows of columns, over which hovers a dome. Also visible are the series of half domes that support the weight of the central dome. Many mosques utilize these same design features. To me, one of the most surprising things about this originally Byzantine Imperial Church is its architectural influence on Islam. After the Ottomans captured Istanbul in 1453 and were awed by the building’s opulence, it became the model for all future mosques. Sure, during the church’s Islamic conversion, the Ottomans stuck some minarets on the corners to accommodate the Call to Prayer. But the domed mosques of today can claim the initially Christian Hagia Sophia as their architectural ancestor. It seems like most religions harness the pagan four elements — fire, wind, earth, and water — to demonstrate the power of their deity. On your way into Hagia Sophia, you’ll pass by an early Christian baptismal pool (the “water” part of the ritual) carved from one solid chunk of marble ten feet long. Nearby jars held olive oil (representing “earth”) that was also used in the baptismal ceremony. Swinging incense burners symbolized wind, while lighting candles and lamps represented fire. We still use all these pagan elements in Christianity today. Also on approach to Hagia Sophia, you’ll see a fountain and rows of water spigots installed by the Ottomans for Muslims to practice the rite of ablution — washing your face, hands, and feet before entering into a mosque. Interesting how both Christianity and Islam make use of a washing ceremony. Judaism does, too, in the form of a mikvah bath. The gallery railing that looks down into the central nave of Hagia Sophia contains runic inscriptions carved by a Norse member of the Byzantine Emperor’s Varangian Guards during the Viking Age (8th – 11th Century). Scholars think its says the equivalent of “Halfdan (meaning ‘half Danish’) was here.” I knew we’d find the pagan Vikings in here somewhere! Seems like everywhere I go, there’s a Scandinavian connection. Before it fell entirely, the Roman Empire split into two parts. The eastern half, ruled by the Greeks, was called Byzantium. Constantinople (Istanbul) was Byzantium’s capital city, and Hagia Sophia (meaning “Divine Wisdom” in Greek) was its Imperial Church. 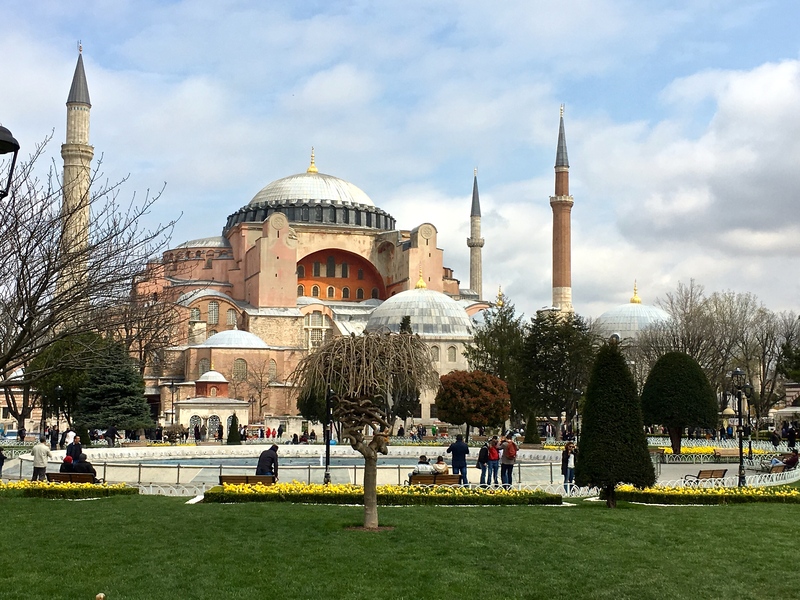 When Hagia Sophia’s patron, Emperor Justinian I, entered the church for the first time, he’s said to have exclaimed, “Solomon, I have surpassed you.” Quite a humble guy, wasn’t he? The intertwined monograms of Emperor Justinian I and his wife Empress Theodora adorn the capitals of the green columns seen in the previous image. Byzantine Emperors entered Hagia Sophia through this hallway, nicknamed the Vestibule of the Guards because the Imperial soldiers hung out here while their ruler attended church services. The mural above the vestibule door dates back to the 11th century and shows Mary and Jesus being presented with gifts from two important Byzantine Emperors. Constantine (right) offers the city of Istanbul, and Justinian (left) serves up Hagia Sophia itself, his greatest claim to fame. The Imperial Gate (center) leads into the central nave. The walls in this vestibule are lined with inch-think, book-matched marble panels. The ceiling above displays original, 6th-century mosaics. Since these designs are geometric, they were left intact by Christian Iconoclasts (8th Century) and Ottomans (15th Century), both of whom believed representations of people in a church or mosque were idolatrous. Called the Omphalion, the green marble circle in the middle marks the spot where the Emperor would sit during church services. The coronation of every Byzantine Emperor was held on this big dot. Anthemius, the Greek geometrician who designed the dome, wanted it to appear as if it were suspended from heaven on golden chains. So he used columns that supported arches filled with glass windows to create the illusion that the dome is floating. (You squint when you look up into the light, which makes the columns disappear.) Note the seraphim (winged angels). Two still have their faces covered by golden masks installed by the Ottomans, but the third’s mask was removed during a 2010 restoration. When the Ottomans took over Istanbul in 1453, they converted Hagia Sophia into a mosque by adding minarets, a minbar (a pulpit for the Imam to deliver sermons from), and a mihrab (a prayer niche that marks the direction of Mecca). Eight enormous calligraphic medallions hang from the base of the various apse arches. At 24 feet in diameter, they’re said to be the largest Islamic calligraphic art in the world. The one you see here bears the name of Muhammed, while the others are painted with the names of Allah and leading figures in Islam. The intricate gilded cage beneath the medallion is the Sultan’s loge, his personal prayer platform. This mosaic has a Deësis theme. (The word means “entreaty” in Greek.) It shows Mary and John the Baptist pleading with Jesus for the forgiveness of sinners. I’m showing only Christ in the photo so you can see close up how incredible the mosaic work is. It dates to the 13th or 14th century and is considered the finest mosaic in Hagia Sophia. The only reason figurative mosaics like this survived the age of Iconoclasts and Islam is because they were plastered and painted over, and later rediscovered during restorations. 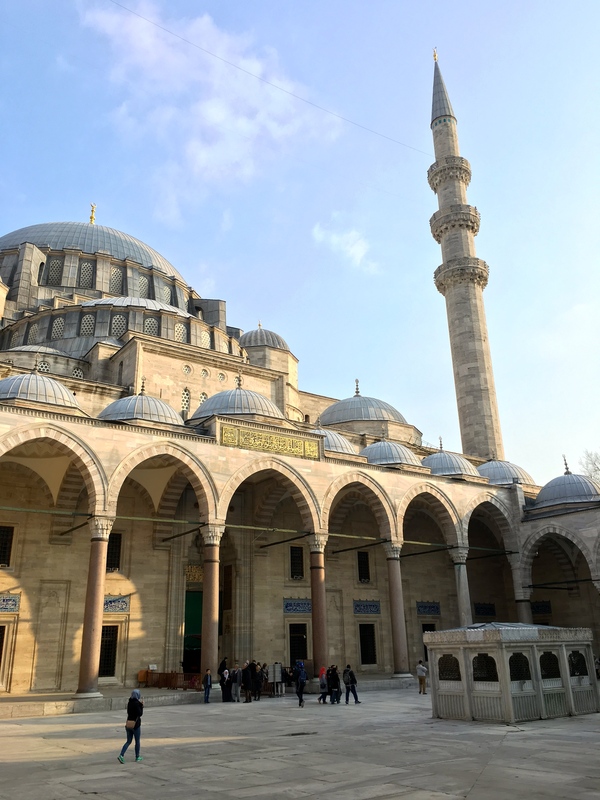 The Blue Mosque’s actual name is the Sultan Ahmet Mosque, in honor of its benefactor. To design it, Sultan Ahmet hired famous Ottoman architect Mehmet Aga — the same guy who built the Kaaba, the holiest shrine in Islam at the center of Mecca’s mosque. If you didn’t believe what I told you about Hagia Sophia inspiring the design of mosques, just look right across the street to the Blue Mosque (c. 1616), considered one of the world’s finest. With its domes and minarets, it mimics its neighbor, but trumps most every other classic mosque in size and grandeur — except for the one in Mecca. 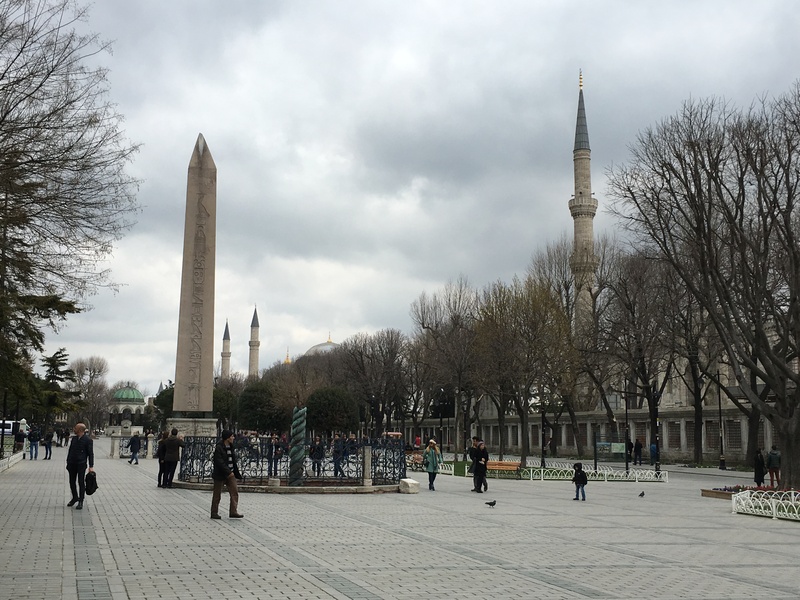 The Blue Mosque’s patron, Sultan Ahmed I, wanted to show off, so he had his architect build six minarets. The sultan in Mecca one-upped him by adding a 7th to his own. We took a tour of the interior, which is wallpapered in stunning blue tiles (hence the mosque’s nickname.) Then our sweet, elderly guide gave us a quickie refresher course in the practice of Islam just as the Call to Prayer was beginning. As we exited, I watched folks stream inside to the singing of the muezzin, just like Christians do when the church bells ring. It seems we all need reminders to make time for personal reflection and connection with our community. Matthew snapped a photo of this mural that shows the inner courtyard of the Blue Mosque. In the center is an old fountain once used for ablutions (ritual washing) before prayer. New washing stations sit along the wall at the entry to this courtyard to accommodate more people. When the mosque itself fills up on special holy days, the overflow population prays here in the inner courtyard. I guess Muslims have their equivalent of “Chreasters,” too (Christians who attend services only on holidays like Christmas and Easter). Before heading into the mosque, visitors can check out this handy-dandy international sign to make sure their attire is appropriate. I love how the girl in the hoodie seems to have a bit of an attitude problem. Apparently my pants were too tight to meet the dress code. (Thanks to all that fabulous Turkish food!) So the staff lent me a skirt. Not all the mosques we entered were this strict. Doing a bit of research on the topic, I learned that the Quran encourages modesty but does not define it as wearing a robe, headscarf, or face covering. Different branches of Islam interpret modesty in different ways. Christianity is much the same; some conservative sects believe that scriptures indicate women must wear long skirts, long hair, and caps, and cannot wear makeup or shave their legs. The Blue Mosque’s central dome, seen here, was modeled on Hagia Sophia’s. It measures 141 feet in height and 110 feet in diameter. While the dome itself is painted, the piers that support it, and the lower-level walls, are covered in tiles from Iznik (ancient Nicea), a city known since Byzantine times for its skill in ceramic painting. The predominantly blue color of these tiles is what gives the mosque its nickname. Notice the huge “elephant foot” column that supports the dome. Using pillars like these enabled the architect to create a series of cascading domes and half-domes. Check out the carved marble “Arabesque stalactites” that provide the transition from the base of the domes to the piers and columns. More than 20,000 traditional Iznik tiles cover the first-floor walls and piers of the Blue Mosque. Tulips are the main subject, arranged in 50 different tulip designs. The balcony tiles seen here are less traditional and feature other kinds of flowers, as well as trees and fruit. I love the fact that they resemble individual little prayer rugs. Behind me is the main prayer area for men. The little house is where the choir sings “a capella,” since Islam doesn’t use music in services. Women can pray only in the cloistered areas that run around the back and sides of the mosque, and also in the balcony. Segregation is intended to reduce distractions and discomfort. Since Muslims pray on their knees and bow repeatedly with their foreheads on the floor, it would be a little uncomfortable for a woman to have a man staring at her bobbing bottom throughout the services. 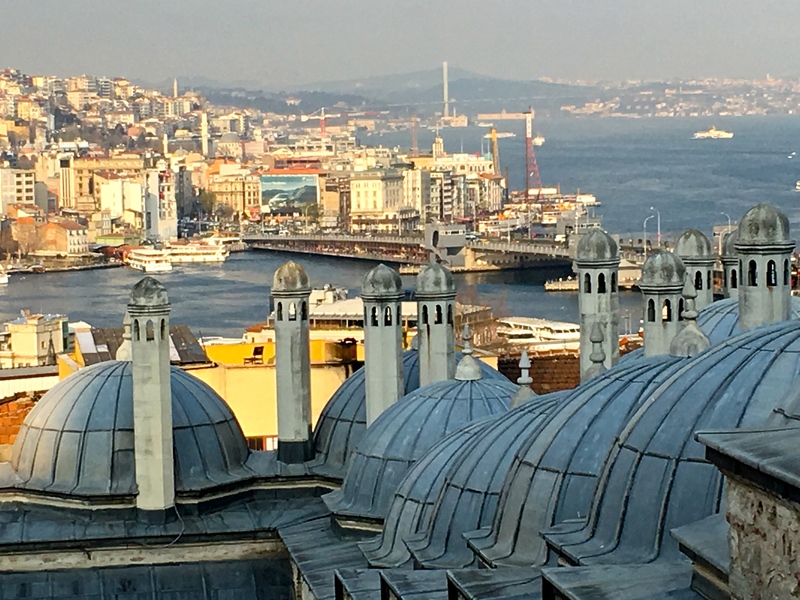 The Süleymaniye mosque complex looks out over the city. In the distance, you can see the Galata Bridge crossing over the Bosphorus Strait. Just one more mosque, I promise. Think of it this way: you wouldn’t go to Rome without checking out all it’s most famous churches, would you? Anyway, this mosque is my favorite. Maybe it’s because it reminds me a little of the Dome of the Rock, which I visited many times during my summer-school stint in Israel. Or maybe it’s because it possesses an air of unearthly peace, glowing softly white on a hilltop high above the city. The little latticed fountain in the middle of the mosque’s courtyard was once used for ablutions before prayer. The muezzin would sing the Call to Prayer from the minaret’s balconies. Nowadays, loudspeakers provide an assist. Perhaps my favorite moment at Süleymaniye was sitting in the tranquil courtyard, absorbing its meditative stillness. The little lattice fountain in the center gurgled away, lulling me almost to sleep. My nose caught the scent of rosewater as it drifted out from the mosque’s interior, where the perfume is diffused to enhance worship. The Turkish have a saying, “To smell a rose is a God-rewarded deed.” I say Amen to that. As I headed to the fountain, a tiny elderly woman wearing a black robe and head-covering attempted to step down from portico. Realizing the drop was too deep for her to manage, I moved to help her, but she waved me away, embarrassed. Continuing on my way, I felt a tug on my arm. I turned, and her toothless, wizened face beamed up at me. She patted my shoulder in thanks, then grabbed my hand, depositing two wrapped toffees in it. Sometimes no words are needed to communicate welcome. A series of ablution stations run along the outer courtyard walls, where you can see people preparing to wash their face, feet, and hands before prayer. The fairytale entrance to the mosque’s inner courtyard displays a verse from the Quran. Notice the incredible “stalactites” hanging from the Arabesque arch. The little courtyard fountain, with its graceful interior, is no longer used for ablutions. The interior shows how Sinan worked to improve upon Hagia Sophia’s design by spanning a large space with a dome using as few columns as possible. (There are many fewer pillars in this mosque than in Hagia Sophia.) By the way, look closely at the chandeliers, and you’ll see an occasional tasseled ostrich egg strung up in between lamps. Folks believed that ostrich eggs somehow kept away spiders. The central dome has a span of 90 feet and has been embedded with open earthenware jars to enhance the acoustics. The Mausoleum of Süleyman the Magnificent, also designed by Sinan, sits behind the mosque. Inside rest the bodies of Süleyman and his heirs. The walls are coated with some of the most beautiful blue Iznik tiles in Istanbul. Süleyman the Magnificent’s wife is buried in another nearby mausoleum. A blonde Ukrainian slave girl who manipulated her way into becoming Süleyman’s chief wife, Roxelana was one of the most powerful women in Ottoman history. She bore Süleyman four sons, but only one survived. It’s said she had dozens of people executed to secure her son’s crown. Roxelana rests in the first box, called a Cenotaph. The tile work and wooden inlay door are spectacular! Built in 203 A.D. but enlarged by Constantine in 324 A.D., the Hippodrome is still a major feature in Instanbul’s landscape. Just like the Romans, the Byzantines –who were the Greek successors to the Roman Empire in the East — liked their chariot races. And of course, their capital city of Constantinople (Istanbul) had to have the biggest and best racetrack in all the land. Only bits and pieces of it are left today, but they tell fascinating stories of a time when winning charioteers were the equivalent of soccer stars. My strongest memory of this place is wandering around it the morning after the Taxim attack, listening to the Call to Prayer being broadcast from the minarets of the nearby Blue Mosque, and thinking that the muezzin (the singer who performs the wailing song) sounded particularly grief stricken that day. There’s nothing quite as soul-stirring as hearing this haunting cry for remembrance. A paved road follows the Hippodrome’s original racetrack shape, and Sultanahmet Square preserves its Spina (center strip). In 395 A.D., Emperor Theodosius decided to gussy up the Spina a bit by adding statues and two obelisks — one he robbed from Egypt, and the other he had crafted on the spot. Also still standing is the curved end of the Hippodrome, called the Sphenodone. It’s basically a support structure made up of 25 vaulted chambers and a corridor that led to the stone bleachers. Great building material, these bleachers were disassembled over the years and used to contruct other things like the Blue Mosque’s courtyard, which sits where the Emperor’s royal viewing platform (called the “Kathisma”) once stood. I borrowed this reconstruction from the BestBookings website to give you a Hippodrome 101 lesson. See the strip in the middle with the obelisks? That’s the Spina. The curved part on the end is the Sphenodone. The white fancy house on one side is the Kathisma (Emperor’s Loge). The whole stadium held 100,000 fans, organized into four teams (the Greens, Blues, Reds, and Whites) according to their social status / political party. Each team backed two charioteers during the races. Emperor Theodosius had this Egyptian obelisk (which dates to 1490 B.C. and honors Pharaoh Thutmose III) carted here from the Temple of Karnak in Luxor and re-erected along the Spina. The obelisk was cut into three pieces for transport, and today only the top one-third of it still survives. The Byzantine base of the Egyptian obelisk shows how Emperor Theodosius’s construction crew used pulleys to raise it into place. Here, Emperor Theodosius can be seen surrounded by racing fans as he prepares to hand an olive wreath to the winning charioteer. His more practical servant stands by with the real prize — a sack of coins. The Latin inscription below says it took 30 days to erect the obelisk, but the Greek text on the other side says it took 32. Only the upper jaw of one of the snakes from the serpent column is preserved in the Istanbul Archaeological Museum. Okay, so this structure doesn’t date back to Hippodrome days, although it sits in the same plaza. It was given as a gift to the Ottoman Empire by Kaiser Wilhelm II in 1898. (Yes, the Ottoman Empire lasted that long!) The Ottomans backed the Germans in WWII and as punishment, the Allies intended to carve Turkey into pieces for the victors. But Mustafa Kemal, a former Ottoman Empire army officer, fought off the Allies and eventually established a secular Turkish Republic. Later, the Turkish parliament bestowed upon him the honorary title of Atatürk (“The Grand Turk”). Yeah, the concept seems pretty boring, doesn’t it? Touring a water reservoir really didn’t sound like much fun to me, either, but friends swore that it was a “must-see.” They were right. The atmospheric Byzantine cistern looks like the perfect place to stage a production of Phantom of the Opera — you can just imagine the caped, masked maniac paddling his fainting Christine through the flooded forest of columns. Or if you’re more into action movies than musicals, check out From Russia with Love, which was shot in Istanbul. James Bond gets rowed through the cistern by MI6 agent Kerim Bey, who uses a periscope to spy on the Russian Consulate. Good stuff. Emperor Justinian of Hagia Sophia fame also built this giant underground reservoir in the 6th Century A.D. He recycled stone parts from old Roman ruins to support the Romanesque-vaulted ceiling with 336 columns. The size of two football fields, the cistern holds 27 million gallons of water to support the population of Byzantium’s huge capital city. In Byzantine times, the Valens Aqueduct carried water 12 miles into the underground cistern. Today, the cistern is just a shallow pool fed by rainwater that seeps in through cracks in the plaster. Pumps prevent the area from flooding, and a boardwalk allows visitors to stroll through. Unlike in the James Bond movie, we didn’t see any rats; just lots of fish. Deep within the cistern, two Medusa-headed carvings act as column bases. Romans used gorgons like these to scare away evil spirits from public buildings. But during Christian Byzantine times, it’s possible that pagan symbols like these got relegated to the cistern so converts wouldn’t be reminded of their dark past. This Medusa is a bit more cheerful, offering a smile. Look closely and you can just make out the snakes that form her hair. The so-called “crying column.” One legend says it was erected in memory of the slaves who died building the basilica that once stood on this site. (The basilica was torn down by Justinian to make the cistern.) My personal feeling is it looks more like an attempt to carve a palm tree trunk. Check out this lavish room, complete with enormous brass fireplace and painted dome, in the Harem of Topkapi. If I had to sum up this place in a phrase, it’d be: Sensory Overload. 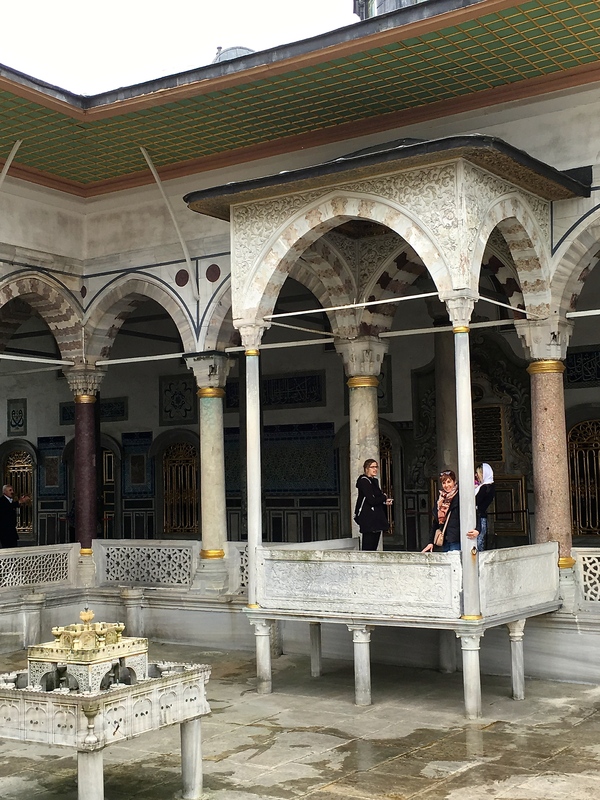 Touring Topkapi is a bit like visiting Versailles, but with a Turkish twist. Silk carpets, inlaid wood, ornate metalwork, Iznik tiles, gold leafing — everything thickly piled on like a cake iced with a spackling knife. It’s a mishmash of colors, textures, patterns, and materials, all designed to advertise the wealth and power of the Ottoman Empire’s sultans. I myself am addicted to the whole orientalism look, as our home in Chicago can attest to. Matthew often gently prods me when I talk of tossing in more, saying, “Honey, I think we might have enough patterns going on in this room right now.” But even I, at the end of our visit, was completed jazzed from the visual stimulation, like I’d had ten cups of Turkish coffee. Add to that the intense palace intrigue — stories of harem murders, mad sultans, and passionate affairs — and I felt like I needed a shot of whiskey or a valium to recover from all the excitement. Topkapi is definitely a “can’t miss it” monument, but I’d give yourself a full day to explore the rambling palace complex. You’ll need to periodically plop down in one of the courtyards for some mental “white space” before tackling the next visual feast. Pictured is the ceiling of the Hall of the Ablution Fountain. Eunuchs guarded this main entry into the harem — the sultan’s family home. The main function of the harem was to ensure the succession of the throne, raise the offspring of the sultan, and prepare them for their duties. The Privy Chamber of Sultan Murat III is considered one of the oldest and finest rooms in the palace (1578 – 1590). It boasts Iznik tiles, marble shelves, cabinets with mother-of-pearl and tortoise-shell inlaid doors, and a fireplace with a gilded tombac hood. The Baldachin throne — the thing that looks like a canopy bed — dates from the 18th Century. The Imperial Hall — a reception space — is the largest room in the sultan’s private apartments. Around the room run verses from the Quran. What looks like a canopied bed is actually the sultan’s throne. Look closely at the prayer niche; it has a detailed floor plan of the mosque complex at Mecca, all done in glazed ceramic tiles. I had to throw in this jarring anachronism. The 70s called … they want their phone booth back. The Fourth Courtyard of the palace is a quiet place that looks out over the Golden Horn and the Bosphorus. The Sultan’s Chamber is behind me. Check out these gilded niches meant to hold the turbans of officials. The Queen Mum managed the household and selected her son’s four wives. The mom and wives together then selected the female servants for the household (slave concubines), who often numbered in the hundreds. The mom and wives got to pick who the sultan slept with — four women known as “haseki” (“favorites”). These girls were supposed to use birth control to avoid getting pregnant, therefore keeping the line of succession clear. But if they did bear a son, they became known as “Haseki Sultan” and became fair game for court intrigue, which included things like being poisoned, strangled, or otherwise maimed by the other wives, haseki, or Queen Mum in the battle for power. The eight domes in the church are unbelievable. (I don’t have any photos of the exterior, though, as it was completely under wraps for restoration.) Many of the domes act as a form of a family tree, tracing the lineages of Jesus, or the patriarchs and apostles. This one shows the genealogy of Mary. Hey, at least it’s not another mosque, right? 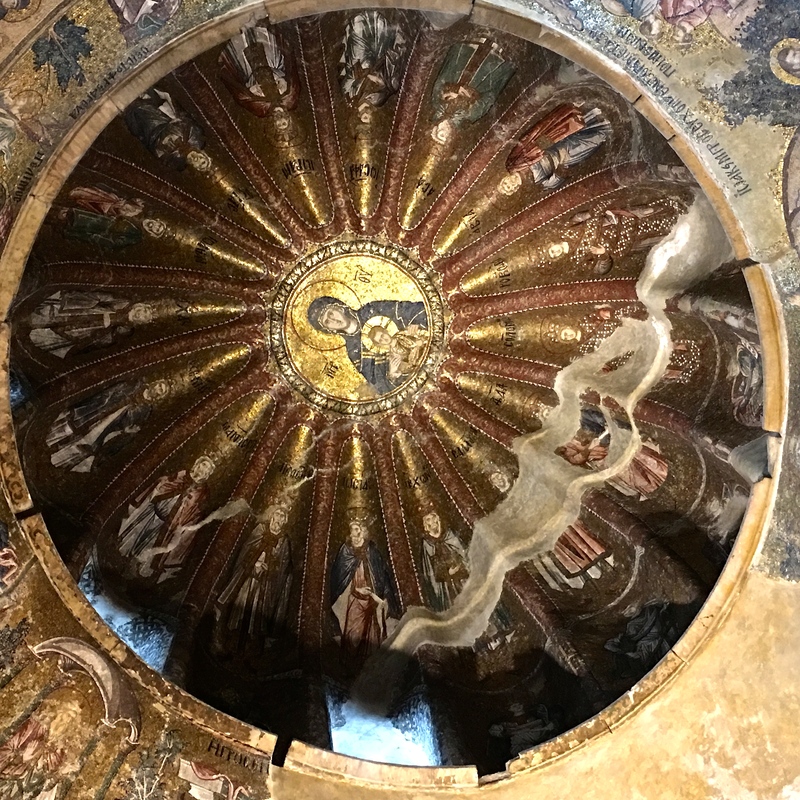 Okay, technically it was converted into a mosque by the Ottomans for a time, but when you check out the mind-blowing mosaics inside, you’ll see that Chora very definitely began its life as a Christian church — an Orthodox monastery, in fact. The ceiling reads like a Greek-icon picture book of the Bible, relaying all the old favorites, with sad-eyed, unibrowed Byzantines playing the full cast of characters. Spending an hour gazing up at such gilded glory will leave you with a serious crick in your neck, but it’s totally worth it. The name “Chora” is a double entendre. In Greek it translates as “pasture” or “territory,” referring to the fact that the church sat outside the city walls. But it also tips its hat to the Virgin Mary, who’s often referred to as the “unplowed field.” Kinda sounds like bawdy romance-novel language, doesn’t it? Anyway, that’s Mary up above the window, with the fetus baby Jesus still in utero, represented by a floating bubble over her belly. The image references another of Mary’s nicknames: “The container of the uncontainable.” Nice to be reduced to a mere metaphorical piece of Tupperware, isn’t it? Pictured are scenes from Mary’s childhood. Her elderly parents left her in the care of priests at the temple when she was 4-5 years old, fulfilling their promise to God, who blessed them with a child in their old age. Here, they’re saying goodbye before they let her go. The most interesting mosaic of Mary’s life, running right along the bottom nearest you, relays a story I’ve never heard before. Fifteen-year-old Mary wasn’t so keen on getting married and wanted to stay with the priests who raised her. But God told them to gather all her suitors, who had to lay their walking sticks on the table. The owner of the stick that sprouted green leaves was to be her husband. Mary looks on, not seeming too pleased that the winning rod belonged to Joseph, a 50-year-old dude who already had a passel of kids from a previous marriage. Pictured is a stunning mosaic of St. Demetrius. To his left are scenes from the birth of Jesus. Most of the mosaics date to the 12th century and were made by drawing rough pictures on plaster, then embedding them with colored and gilded square tiles of ceramic, glass, bricks, and stone. Here, Jesus is pictured as “Christ Pantocrator,” meaning “Lord of the Universe.” I love how little rows of white tiles give him crows’ feet and frown lines above his unibrow. Above his left shoulder is an image of the first miracle he performed — jugs of water being turned into wine at the wedding of Cana. Over his left shoulder, he multiplies the five loaves of bread and two fishes to feed the 5,000. In addition to the church mosaics, a side mortuary chapel (the Parakklesion) has some unbelievable frescoes. It was dedicated to Theodore Metochites, who refurbished the Chora Monastery / Church in the 11th century and put in all the murals. The guy has a pretty fascinating history. He started off life in exile because his parents had tried to reunite the Eastern Orthodox and Roman Catholic faiths. He worked his way back into favor by arranging marriages for the Emperor and his cronies. Over time, he became treasurer, and later prime minister. But when a fight broke out between rivals for the throne, Metochites backed the wrong guy and was exiled once again. Eventually, he was allowed to return and became a monk in his own monastery. Here, Mary and Christ get center stage while famous angels (most of whom I’ve never heard of), circle around them. Pictured are the Orthodox Church fathers, St. Basil, St. Gregory, and St. Cyril. These figures look incredibly modern to me, almost like murals by Charles Rennie Mackintosh and his wife Margaret McDonald. If you love Islamic art and textiles (which I do), you’ll enjoy all of Istanbul’s museum offerings. But if you’re not a huge fan of the ornate, you’ll probably get enough of pretty objects by visiting the mosques and Topkapi Palace. And on that note, here’s a sample of some of the gorgeous pieces we enjoyed. Stay tuned for my next posts to learn more about quintessential experiences in Turkey — including a Turkish Bathhouse. 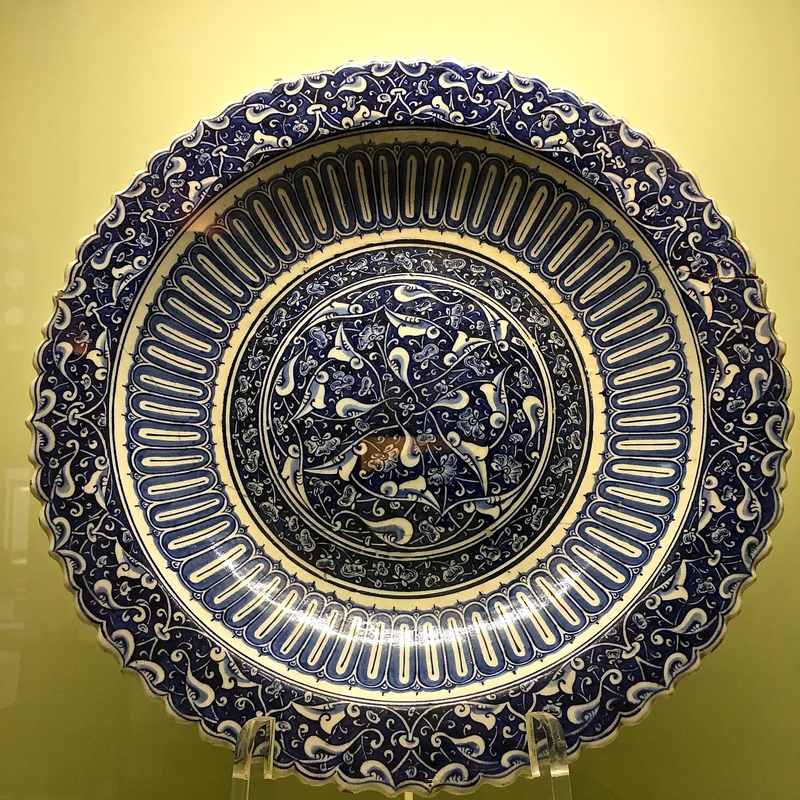 If you do just one museum, I’d make it the Turkish & Islamic Arts Museum, as it has a smattering of everything: ceramics, inlay, glassware, carpets, statuary, you name it, from many eras. The building itself is gorgeous, and the items are curated beautifully. Pictured here is a dragon doorknob from the Great Mosque of Cizre. In the same museum is this example of a fabulous brass bowl with dragon handles. The Vikings would’ve loved it. Turquoise Raqqa pottery from the Ayyubid period (1170 – 1462). I’m in love withe fish-headed pitcher. Cups from the same era. The colors and paintings on the glass are adorably cartoonish. I swear the figure on the right looks like a character from The Simpsons. Check out this intricately illuminated Quran. Geometric and floral embellishments like this are called Tezhip. The elaborate calligraphy is called Hat (pronounced “hot.”) The two types of artists work together to create illuminated manuscripts, scrolls, and books. The work was done by scholars in a madrassa (theological school), similarly to how Medieval Christian monks in monasteries created illuminated Bibles and other written texts. A pair of gorgeous Quran holders, inlaid with mother-of-pearl, tortoise shell, ebony, and ivory. My great grandmother had a small tabletop Bible stand that looked similar. A beautiful Baroque gate marks the entrance to the Istanbul’s Carpet Museum. The Carpet Museum holds a small but beautiful collection with great information about the symbols used in the weavings. Some of the pieces are more than 500 years old, but appear bright and beautiful, like they were made yesterday. Just goes to show you that a good carpet lasts. Matthew mimics the Assyrian Ruler Shalmaneser III. His big eyes make the king look a bit terrified, but they’re supposed to indicate that he’s far seeing, knows all, and is in communication with the gods. Nice kitty, nice kitty. He’s a Hittite creation (the Hittites lived in what is now Syria and Turkey). The museum has remnants from all the obscure Biblical cultures. That’s why I studied Near Eastern Archaeology (what used to be called Palestinian or Biblical Archaeology) — you get to learn about all the cool ancient cultures — Mesopotamians, Assyrians, Hittites, Egyptians, Greeks, Romans, etc. — because everyone mingled over the land bridges of Palestine and Asia Minor. The Istanbul Archaeological Museum also has a building devoted to Turkish tiles and ceramics. Called the “Tile Kiosk,” it has an Arabic inscription above the doorway that reveals the building was constructed in 1471 — 20 years after the Ottoman conquest of Istanbul. It’s the only civic building from this era and was constructed during the reign of Mehmet the Conqueror. The interior holds some of world’s finest examples of Ottoman Empire ceramics and tile works. I seriously think I could live in just this one room the rest of my life and be perfectly happy, it’s so gorgeous. Your pics are delicious! I was there with Ian (he & dance partner were representing US firgureskating in a Jr Gran Prix Ice Dance event) about 8 years ago — my pics are way less impressive, but seeing your excitement at being there brought back so many great memories! We saw many of the same highlights — thought of you guys the whole time we were there! And, of course, the past few days — so sad, not to mention harrowing, for those there now. Hello Kimberly I saw your new post last evening as I got back home but decided to keep it for the next morning. I then went downstairs to watch a little TV before going to bed. Well…. to see the attack on the airport I’ll probably never go to again. How very, very sad. You or I could have been there, what a scary thought! I am so happy I did make it to Turkey, such a beautiful country and people, as I fear I never would have made it at all. It’s getting difficult to choose where to travel, isn’t it? I have no idea where I’ll travel next winter but will have to give it very serious thought very soon. Where should I go?….. Yes it’s so sad. I’ve been trying to convince my sister and niece to go with me again, but that will probably never happen now, as they were already quite nervous about the idea. We will be in Chicago for a week soon, I’ll let you know when we’ve nailed down our dates. Hope to see you soon!